An artist's depiction of the French W3C communications satellite in orbit. A French communications satellite destined to serve markets in a swath from Europe to the Indian Ocean launched on top of a Chinese Long March rocket Friday. The spacecraft will be operated by Eutelsat, a leading international communications satellite owner based in Paris. Named W3C, the platform carries Ku-band and Ka-band transponders for television broadcasting and data services, according to Eutelsat. The satellite lifted off at approximately 0820 GMT (4:20 a.m. EDT) Friday from the Xichang space base in southwest China's Sichuan province. It was Friday afternoon at the launch site. The almost 12,000-pound spacecraft was deployed by the Long March 3B rocket's third stage about 25 minutes later. European-built spacecraft were launched by China in the last decade, but they were for operators in Asia. Most Western communications satellites are restricted from launching on Chinese rockets because the U.S. government classifies space hardware as weapons systems under the International Traffic in Arms Regulations, or ITAR. The ITAR standards were expanded by the U.S. government to include satellites due to concerns that China could apply space launch experience toward missile development. ITAR rules prohibit U.S.-built space hardware from launching on Chinese rockets, but Thales Alenia Space offers an "ITAR-free" version of its satellites without U.S. components to permit flights from China, which are often less expensive than other launch providers. Eutelsat reported the W3C satellite was in good shape following launch. It's solar arrays were partially deployed within three hours of separation, the company said in a statement. In the next 10 days, the W3C spacecraft will raise its orbit to an altitude of 22,300 miles over the equator and unfurl its communications antennas, according to Eutelsat. "Our sincere appreciation to Great Wall Industry Corporation for the excellent performance of this launch, and to Thales Alenia Space for their dedication to this sophisticated and challenging program," said Michel de Rosen, CEO of Eutelsat. "This is a new milestone, achieved only 14 days after the launch of our Atlantic Bird 7 satellite." Atlantic Bird 7 was placed in orbit by a Sea Launch Zenit 3SL rocket Sept. 24 to serve Africa and the Middle East. 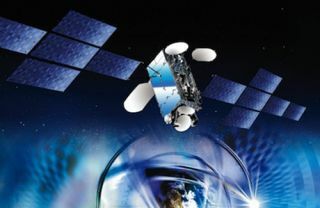 "With these two new satellites scheduled to enter service during the second quarter of our financial year, Eutelsat will be equipped with new resources to meet strong client demand across dynamic markets in Central Europe, Africa and Indian Ocean islands, strengthening our confidence to meet our objectives for the year," de Rosen said in a statement. W3C is based on the Spacebus 4000 C3 platform built by Thales Alenia Space. Its 56 transponders, divided among Ku-band and Ka-band, will beam programming and services to Earth via four footprints tailored for specific regions. One focus of the satellite will be direct-to-home television broadcasting in Central Europe and digital video services in the Indian Ocean islands, including Mauritius and Reunion Island. Another mission for W3C is connecting Europe and Africa through Ka-band, enabling Internet access and providing Ku-band coverage from Senegal to Madagascar, according to Eutelsat. Data networks and news organizations in Europe, North Africa and the Middle East will also benefit from the new satellite, Eutelsat said. W3C will be positioned at 16 degrees east longitude, replacing three Eutelsat satellites currently at that location.